Review: 'The Twilight Zone' Has Old Fears And New Voices A new incarnation of The Twilight Zone, narrated and executive produced by Jordan Peele, sees community somewhat differently from the original, but retains its sense of moral peril. Jordan Peele acts as the narrator on the new incarnation of The Twilight Zone. The Twilight Zone ran from 1959 to 1964. It was adapted into a film in 1983, then revived on television for brief runs in 1985 and 2002. Now, it returns on the CBS streaming service CBS All Access, hosted and executive produced by the man who may be America's most exciting filmmaker, Jordan Peele. He developed the new version alongside a team of executive producers including Simon Kinberg and Glen Morgan (Morgan was one of the primary writers behind The X-Files). 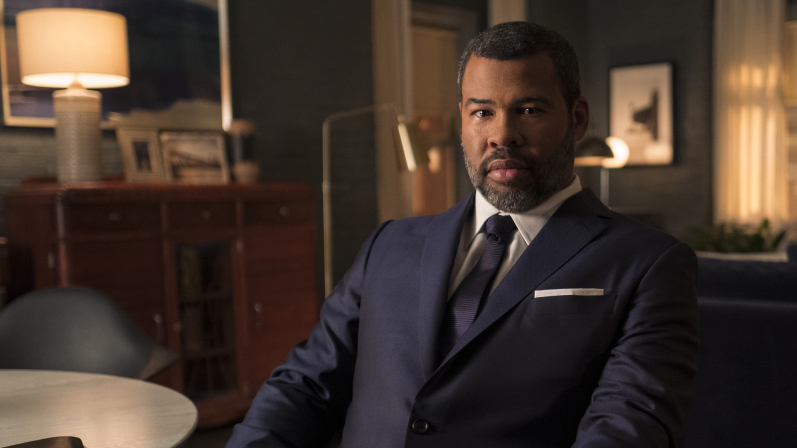 Peele, in his films Get Out and Us, has spent a lot of time thinking about one of The Twilight Zone's central questions, going back to original creator and host Rod Serling: What is the scariest thing you can imagine? It's true that Serling's show was always connected, both in text and in subtext, to events of the moment. The fear of nuclear annihilation was ever-present in characters who built shelters and feared missiles. Allegories connected to the civil rights movement and other efforts to escape systemic injustices were common. Space travel was everywhere, both as opportunity and threat. The human legacy of endless war hung over the world always. Not-fully-trusted technology, like robots and large airplanes, held dangers, while technology that felt as though it might arrive soon, like time travel, perhaps held even more. But while the show touched politics, it was animated by something more timeless. The tell is in the the very first episode in 1959, called "Where Is Everybody?" In it, a soldier wakes up in a town where there are no people, only mannequins. In the end, it turns out that in reality, he is an astronaut inside an isolation booth being tested for his fitness to go to the moon alone, and that the empty town is a simulation inside his mind. His bosses are seeing how long it takes for him to go mad without companionship. This is the fear on which much of The Twilight Zone is founded: fear of isolation. Fear that the community, the whole, will be lost even if the individual is saved. Serling often makes the argument that the scariest thing you can imagine, whatever you think it is, is finding yourself asking, "Where is everybody?" Consider an episode like The Monsters Are Due On Maple Street, a Serling-written classic in which a community becomes convinced it's the target of an alien invasion. Neighbors turn on neighbors, chaos ensues, and the neighborhood destroys itself. It turns out that this is precisely what the aliens who are invading expect: Frighten people and they will attack each other so fiercely that you won't have to attack them. Of course, this is a story about xenophobia, about nationalism — even about responding to terrorism. But it is also a story about how sudden insecurity makes selfishness surge, such that any sense of community is sacrificed. Bonds are broken. And that, ironically, makes the worst fears of the individual come true. Some stories that don't actually involve real danger at all have a similar structure. In "The Shelter," a man's neighbors are determined to break into his underground shelter under threat of alien attack. Not only do they ultimately smash their way in even as he insists that he has no room and no air, but as they bicker over which of them should be allowed in if they don't all fit, they reveal their vicious thoughts about each other. A man spews vile insults at his immigrant neighbor because it turns out his neighborliness ran only as deep as his sense of safety. When it turns out there is no attack, the neighbors realize that they have destroyed their community simply because they sensed a danger. Again, individuals scramble to get to safety at the expense of the community, and they suffer. In "A Kind Of Stopwatch," a mysterious stranger gives a man a stopwatch that stops time. He initially plays around with it, making people freeze in place. But then he exploits it to steal, and during a bank robbery, while time is stopped and he is happily wheeling a cart of cash out the door, he drops the watch, and he cannot restart time. He has achieved his self-interest and has made himself rich, but he is faced with limitless isolation. It's certainly a "be careful what you wish for" story, but it is also about your wildest fantasies being of no value if they are literally the only thing you have. This is even reflected in the famous "Time Enough At Last," where Burgess Meredith only wants time to read books and be alone. And when he finally achieves that goal (nuclear bombs allowed the original Twilight Zone many opportunities to effectively end the world), he breaks his glasses. It turns out he cannot have his ideal life in isolation. Sure, it's partly just a darkly funny "gotcha" story about the painful moment when he loses his dreamed-of reading time, but remember: If he still had a community, he could replace the glasses. This, too, is a cost of being alone. Serling's show also valued connection every time he returned to the fear of not being believed. Characters saw things others didn't, knew things others didn't, and lived in realities that other people dismissed as imagination or even illness. The much-imitated "Nightmare at 20,000 Feet" features a young William Shatner as a man named Wilson with a fear of flying who can see a monster on the wing of the plane in which he's a passenger. What terrifies him is not just the monster; it's that no one else can see it. He has lost the sense that he shares a reality with the people around him. And as a final grace note, as Wilson is being wheeled out on a stretcher, presumed by medics to have hallucinated the entire attack (when in fact he saved the plane from it), Serling gives his final bit of narration. It clarifies that Wilson will soon be vindicated. There is evidence of the monster in the bent metal of the wing, and Wilson will not remain alone in his reality for much longer. This brings us back to Jordan Peele. Peele's first two films suggest something fascinating in the context of The Twilight Zone. What Maple Street might have considered its treasured community is as much a threat as an asset. The accepting, conspiring community of rich white people in Get Out, who might as well live on Maple Street, is the danger. To believe their benevolence — to fully accept their assertions of progressivism — would have killed Chris, the film's hero. And without revealing too much about Us, it also tells a story about how what looks functional and decent on the surface can be hiding a multitude of sins. Chris has some of that Wilson-on-the-plane sense that he is seeing things that other people perhaps can't, or wouldn't — that nobody would believe him about what's really happening. He even wonders if he's imagining it, much as Wilson does, given his recent hospitalization and fear of flying. One difference between Chris and Wilson, though, is that Chris' life has made him ready for it. Chris is ready to find himself in a situation that's not right, from the minute he agrees to visit the house of his white girlfriend's family. This skepticism about the community with power over him ultimately saves his life. Chris has his own community, represented most vigorously by his friend Rod. But he is at risk from, not protected by, the common morality of the neighborhood where danger finds him. So seeing Peele as a driving force behind a new Twilight Zone sets an expectation that while it will carry some of the original's lessons, it will carry new ones as well. He works very specifically in the thematic presence of white supremacy — and by extension in the understanding that whether the individual will be protected by, and enriched by, the presence of the whole depends on who the individual is. To operate as a positive force, the whole must be not only intact, but it must be moral. And indeed, the first four episodes that have been shared with critics, while they feel like they have varying levels of "Twilight Zone-ness," demonstrate that this group of writers is interested in different base fears and different base flaws. It is deeply curious about what is moral. So far, the new Twilight Zone is a little uneven, but so was the old one. It doesn't lack experimental energy or visual imagination; it just seems to be still developing its story voice. It benefits from the freedom to vary episode lengths, which is a feature of streaming services. Episodes can be as long as they need to be. There are more intriguing actors in the cast for the rest of the season: John Cho, Allison Tolman, DeWanda Wise, Chris O'Dowd. All the pieces are in place, and these four episodes demonstrate that the writers have plenty to say.